Ford designers can now put on a pair of 3D goggles and see an entire car in the middle of the office. It's a technology that promises to speed up the car design process and make it easier to involve designers on a global scale. 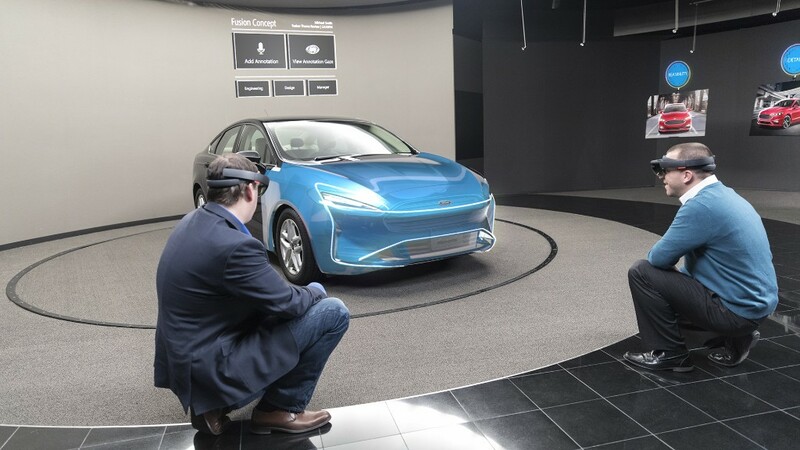 The designers are working with Microsoft's (MSFT) Hololens goggles running software created specifically for the task of designing -- and altering the designs of -- automobiles. With the goggles, designers in different offices can see and work on the same virtual car at the same time. Car designers already work with 3D computer models but they're usually confined to screens where they can be rotated using a mouse. Or, if designers want to see a life-sized computer model they can walk around like a real car, that usually requires stepping into a special room designed just for that purpose. With the Hololens designers can just put on a headset and the virtual vehicle appears wherever the designer is standing, as if it were parked there. The goggles don't obscure the view of the room or the other people in it so designers can move around and converse as they would looking at a real car. Because it mixes computer models and the real environment, the goggles can also be used to overlay new designs onto a real car or physical model. 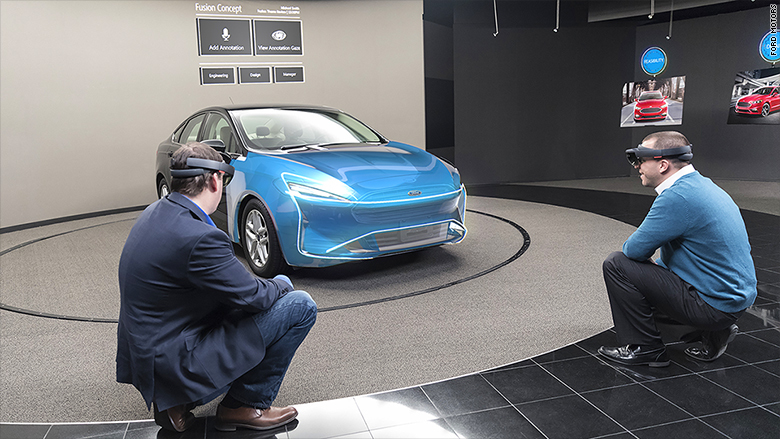 With the Microsoft goggles on, Ford designers can see virtual models as if they were in the room. In the past, if designers wanted to see how a new grill or taillight design would look on a car, they would print it out on paper and tape it down over a full-sized model of the existing car. With the goggles, said Craig Wetzel, a design manager at Ford (F), new virtual front or back ends can be laid on right over a real world model. The devices can be networked so designers working in different locations can work on the same car. If they can't all work at the same time, which can be difficult when people are in different parts of the globe, they can leave virtual notes attached to the model. 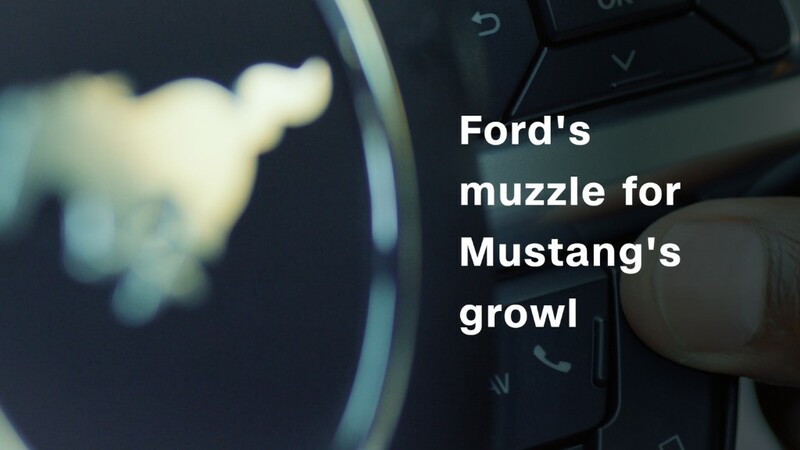 For instance, a note could be attached to a headlight that designer thinks should be a different shape. Later, another designer could play back the message. As it plays, a virtual head shows the angle from which the other person was viewing the model when he or she made the comment. That way designers can literally understand the other person's perspective. For now, the Hololens is still in the experimental stage at Ford, said Wetzel. Designers in Dearborn have worked with it, he said, and the technology is now being introduced globally. As useful as it might be, the Hololens is not expected to replace other design tools, such as the full-size clay models that, designers say, remain the best tool for seeing what a car will look like in the natural world.